Dog training can help you feel less stressed and helps with exercise. Are you thinking of delegating mundane tasks such as dog training to an employee or family member. Do not do it since the activity can have awesome health benefits for you that you never thought. The health benefits are not only yours but also for your dog. Dog walking helps with improved cardiovascular fitness, lower blood pressure, stronger muscles and bones as well as decreased levels of stress. People who walk their dogs have been said to more friendly and caring. The act in itself is one of love and care since the dog wholly depends on you to walk it. It also creates a strong bond between the two of you so that the dog associates you with leisure, good health, play and awesome memories. You might notice that everytime you get home for the dog walking activity, the dog might start wagging its tail in readiness for what is to come. Psychology today says that those who own dogs tend to be happier than those who do not. 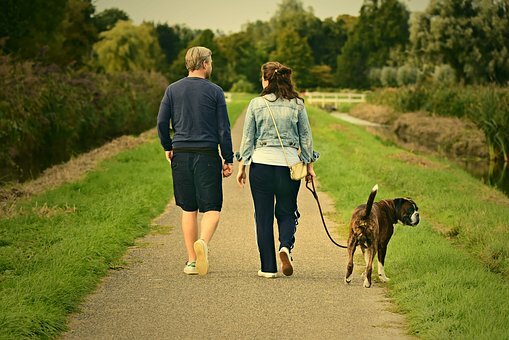 It goes on to show how dog walking can help you to connect with nature since walking it involves going out, observing nature and relishing in its beauty. Being next to a dog according to an article on Pubmed can actually lower your stress hormone cortisol levels so that you feel less lonely. The effect has been shown to be so remarkable that veterans going through PTSD are given a dog to stay with so that they can feel less lonely or traumatic. A journal article on NCBI showed that people who walked their dogs had a better community spirit than those who did not. They were more mindful of their environment, were aware of the projects going on in the community since they are able to explore their surroundings daily as well as are more sociable since they meet with other fellow dog walkers every day. In short, walking your dog is not just a physical activity that helps you with your health but it also makes you a happier and sociable person who understands their community in a better way. Dogs learn through the consequences of their actions. If it does a stupid thing and gets punishment for the same, it will learn from the punishment that what it did was wrong. If it gets a meaty treat after doing something, then it will keep on doing it since it earned him a good treat. The dogwatch collar works in a way that your dolg does not have to stray away into restricted boundaries without you having to pull on a leash. The collar ma akes the dog get a funny feeling around theW neck and it responds by getting back to the allowed area. With audible sounds,the dog over time gets to learn that the sounds are warning that it should not go past a certain boundary. Once your dog does something good, you could give it some meaty treats so that it will associate good behaviour with goodness and therefore try as much as possible to always do the right thing. No dog training would be complete without some chase toys that make the whole exercise fun not only for you but also for the dog. Trizah Wanja works as a palliative caregiver at a missionary hospice in Kenya where she is responsible for taking care of cancer and Parkinson's patients by encouraging them emotionally, spiritually and psychologically. She brings over 9 years of experience into hosiped.